The word "backstory," a contraction of "background story," is a relatively recent addition to English. Hollywood screenwriters began using the term in the 1980s for the potted biographies of characters that actors receive. Now everyone and everything has a backstory, including the 19th-century historic building in Calais known as the Kent Museum. The structure began as Remember Kent's home in 1810 and subsequently served as a tavern, stagecoach inn and general store before becoming a museum, now owned by the State of Vermont and administered by the Division for Historic Preservation. Minimally restored inside, with exposed lath walls, patchwork wallpaper and penciled notes from 1913 scrawled on one wall, the building provides a richly textured and historically layered setting for this year's Art at the Kent show, "Backstory." Some artists, such as Leslie Fry and Jeffrey Simpson, tie their biographies directly to their work. Fry's "Book Leaves," a leaf-shaped cascade of items spilling from a fireplace hearth packed with books, is labeled "Cast plaster, resin and paper; with earth, leaves, coffee, paint, ink, mirror, metallic patinas; with clothes and books from the artist's mother and with pages from Through the Looking Glass, read to the artist by her father repeatedly." Such decaying or eroding objects, Fry writes, "remind us that everything is connected through a creative life force." Simpson uses his "Book Wheel," a set of blue World Book Encyclopedias joined spines-out in a thick wheel and coated with glossy resin, to evoke his father's "challenge" to read and absorb knowledge from books. Just as the books are now locked in place, Simpson writes of his childhood, "a massive tangle of words kept me quite locked up inside the house in my head." Other artists ambiguously blend their own backstories with those of their materials. Textile artist Janie Cohen, who directs the Fleming Museum at the University of Vermont, writes of her childhood associations between fabric and comfort. A self-described "rogue stitcher," she hand-sews pieces of antique cloth together, creating compositions in which it's hard to tell where her hand has been. "Testimony" is an undated, embroidered "signature cloth," signed by a group of women friends, on which Cohen overlaid a white collar left uncompleted in 1876 and sewn with a memorial label by the collar maker's daughter. Cohen sees her own interventions as a "collaboration with Vermont women stitchers of the past." It's difficult to assess any of these works in isolation, given the equally strong presence of their setting. The Kent's 18 rooms of worn wood floors, fireplaces and narrow passageways augment, enliven or charge the art in ways that blank white walls cannot, as do the seemingly unchanged 19th-century exteriors that provide the backdrop for outdoor sculptures. Annual month-long Art at the Kent shows are as much about the interaction of the art and the space as about the art alone. "Hanging takes us a very long time, because we let the museum dictate what's going where," says Emlen. The care is evident. "Flourish," a small cast-bronze head by Fry, rests on a windowsill facing the outdoors, where her sculpture "Nest Builder" stands on the lawn. 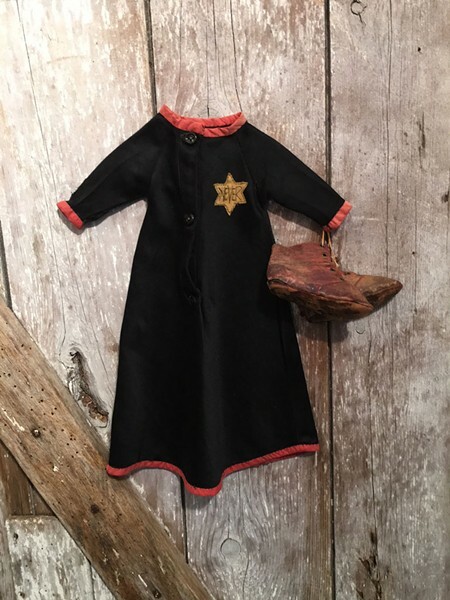 Cohen's "In Our Republic" consists of an old wooden door decorated with a line of looped wire near the top and hung with enamel and tin cups, a pair of shoes and a child's antique dress sewn with a star of David. This first door is then propped against an unused door to the exterior, creating a tension between the work's gesture toward the locked doors of death camps and the welcoming entrance to a former tavern. Upstairs, a sequence of rooms establishes a trail of black, arcing from Rose Umerlik's sweeping, rounded dark brushstrokes on white canvases to Mark Goodwin's textured black surfaces to Daryl Burtnett's "Follower." A painting-like image of a form resembling an elongated house in white, black and grays, the last work is actually a photograph of markings on concrete. Resonances among the artists echo throughout the exhibit, which holds mostly to a muted palette. 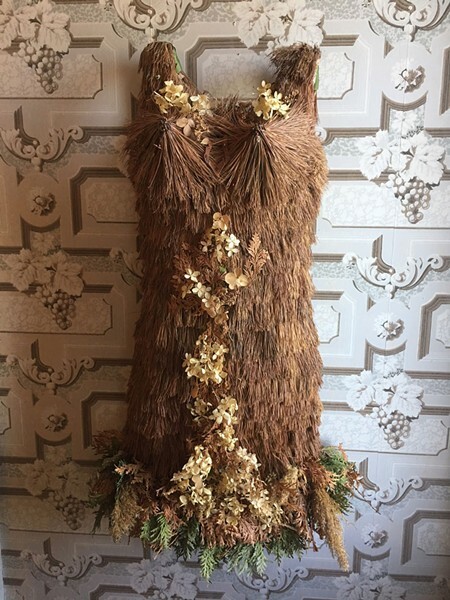 Fry's browning leaves could have escaped from Wendy Copp's breathtaking dresses and footwear, made of pine needles, dried hydrangea, reeds and other natural artifacts. The book leaves of Simpson's tower-like "Natural History" play off Matthew Monk's wall-hung and free-standing box-like constructions of collaged scraps of used paper. Some marked with writing, these hint at untold numbers of backstories. One work echoes the venue itself. Among Bhakti Ziek's unconventional works is a tapestry recreating the Kent's 1913 wall scribblings, though it hangs in a different room. 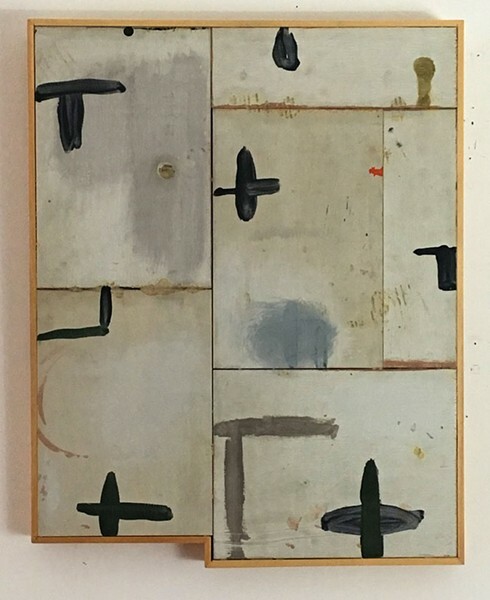 Kate Burnim's landscapes in oil of industrial "discarded and in-between" spaces, each a study in line and form, are far in placement and approach from Rosana Vestuti's astute pencil renderings of architecturally compelling New York City buildings. But the latter, evening scenes set far from the city's night life, are infused with a similar mood of abandonment. The curators created their own resonance at the exhibition entrance. Taking a visual cue from one of Luciana Frigerio's "Nature Morte" silver gelatin prints upstairs, they speared a lemon with scissors and wrapped it with string. The objet lies on a table beneath a wall-hung firmament of Frigerio's bezels, each containing a tiny Joseph Cornell-like assemblage of objects and images. 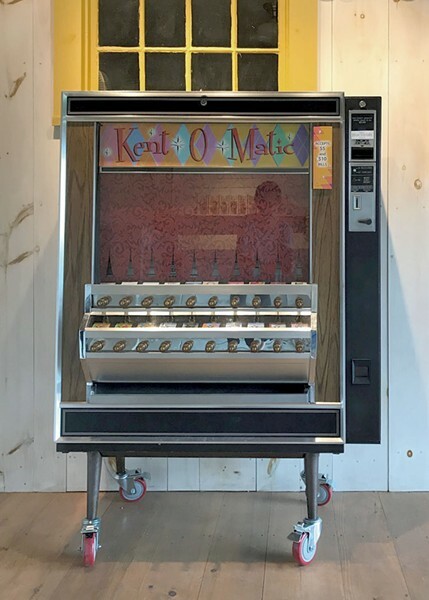 One item adds a touch of humor: the Kent-O-Matic, a refurbished vending machine owned by Frigerio and outfitted by Calais artist Bob Hannan. Visitors can buy a tiny work by an exhibiting artist of their choice by inserting a $5 or $10 bill and pulling a stop. One visitor landed a Burnim canvas in a chic little cardboard box, no bigger than two by three inches; the painting depicts a miniature industrial landscape. Now a decade old, Art at the Kent shows have explored themes ranging from "Refuge" to "Parables" to "Reflections." In an inimitable setting where early autumn light already lends a magical quality to the exhibits, "Backstory" seems to work a kind of alchemy — perhaps because it's the first show to acknowledge and highlight the building's own rich backstory. The original print version of this article was headlined "Much to Tell"